It’s fair to say it hasn’t been a bad week for Eoin Bradley. The striker rejoined Coleraine on Monday, helped them to a win at Linfield on Tuesday, then fired in a hat-trick on his second home debut on Saturday! Bradley took just two minutes to put the Bannsiders in front against Carrick Rangers before securing a hat-trick after Jordan Allan had slotted home a brace to make it a good day all round for the hosts. “It was all about getting into the next round, but to get a hat-trick on my second home debut for Coleraine is very pleasing,” said Bradley. The 33-year-old won the cup with Glenavon last season and he is hoping for a similar outcome this term. 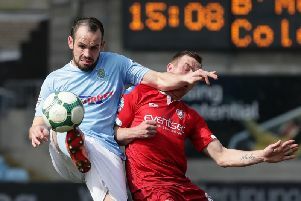 Boss Oran Kearney was delighted with the performance by his side as they made it three wins in a week, and also by the performance of his new signing. “It has been a really good week for Eoin and Jordan Allan, but the team as a whole has been excellent. For Carrick Rangers boss Aaron Callaghan though it was a day to forget. He was angry with the penalty award for Coleraine’s second goal and was sent to the stand for his protestations. “Going 1-0 down after two minutes all that preparation work that you do during the week is gone,” he said. “It was an individual error which is very frustrating. But the second goal is a bad decision by the referee, everyone in the ground didn’t think it was a penalty. “When they went two up their tails were up and it changed the whole complex of the game. “Officials have to look at themselves. I’m disappointed with our performance, but they have to look at their performance too. “We were never in the game, it was over at 2-0. All we could do was try and give some of the new players some game time. “The manner of the defeat really displeased me. “We are better than that, we have showed we are better than that. We showed it against a very good Cliftonville side on Tuesday night. “However, there was four individual errors today and I just can’t accept that. “That’s why the window couldn’t come round quick enough for me, it’s those fundamental errors that we have been making from the start of the season and it has come back to haunt us. “I could bring in another 15 players after that performance today.